Dishwashers can you save you time and effort plus a surprising amount of money on your electricity bills. That’s why we created this guide to help you with some of the more confusing aspects when it comes time to buy, such as installation queries, technical terms like place setting and how to find the machine with the best energy rating. Look out for the ‘Our Experts Love’ range to find dishwashers that showcase the most standout features. And of course, if you want to see what’s on offer for yourself, come down to one of our stores and we’ll be happy to help find the right appliance for you. Save time and money while keeping your dishes sparkling. Simply attach to your main water supply and you’re ready to go. What place setting do I need? Place setting refers to the number of items you can fit into your dishwasher. The higher the place setting, the more items you can fit in. If you have a bigger family and you love cooking, then you’ll require a bigger place setting. If you have a small family or don’t cook as much then a smaller place setting will be more suitable. Bear in mind available space in your kitchen too, as the bigger the place setting, the more space you will need. How can a dishwasher save you money? Dishwashers on average use less water than hand washing, which will help you save money on both your water and electricity bill. Many dishwashers also come with auto sensors which measure how dirty your dishes are and adjust the amount of time, energy and water needed to clean them. How can a dishwasher save you time? All you need to do is scrape off excess food and then pop your dishes into the dishwasher, which takes a fraction of the time than to wash by hand. Dishwashers also have quick wash settings, so cleaning is even quicker. What flexible features should I look out for? To make life easier, look out for a cutlery tray, height adjustable baskets to accommodate larger pots or roasting trays and wine glass holders. After all, wine glasses are generally more fragile and also a kitchen necessity! What do I need to know about installation and the waste pipes? Waste and water pipes are essential for dishwashers, so remember to leave adequate space to attach them to your dishwasher. Consider the depth of your machine, and make sure it will fit snugly where you want to position it. As a rule of thumb, your waste connection and inlet pipe should be no more than 50 cm from either side of where the dishwasher will be. How do I maintain my dishwasher? There are a variety of simple, economical ways to keep your dishwasher in top working order. A great starting point is to always follow the manufacturer’s advice about hard and soft water, as they can both affect dishwasher performance. Jets and heating elements can be blocked by limescale if you’re in a hard water area. You can soften your water by using dishwasher salt, which helps to keep your dishwasher limescale-free and in good working order for longer. You can also save money by regularly topping up the reservoir with granular salt, which helps you use less detergent and rinse-aid. Rinse aid helps reduce drying time and leaves your dishes shiny and streak-free. You add it to a special compartment and it’s released during the final hot rinse to reduce uneven drying and smearing. Indicators on many machines will also notify you when it's time to refill your salt or rinse aid reservoirs. Detergent comes in powder, tablet or liquid form. 3-in-1 and 4-in-1 tablets often include rinse aid and/or salt-based compounds, but hard water areas may affect how effective they are. That’s why it’s best to use separate detergent, rinse aid and salt, which can also help save money. Regularly applying dishwasher cleaner will help descale, degrease and freshen up your machine. You can also go one step further and use dishwasher fresheners, which provide a pleasant fragrance when you open the machine door. Which dishwasher is best suited to me? 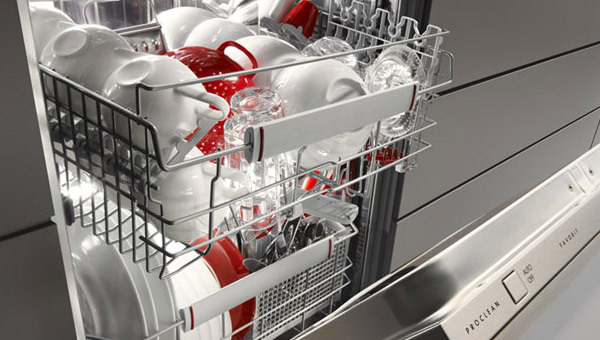 The main consideration when buying a dishwasher is capacity. Larger families will have more dishes to wash, so a higher capacity will help you do more on a single wash and save money on energy bills. You should also consider the appliance’s energy rating, which ranges from A+ to A+++. The higher the rating, the more money you ‘ll save on energy bills over the long term. An integrated dishwasher is hidden behind what appears to be a cupboard door, so you get a more uniform look to your kitchen. Integrated dishwashers are great for small kitchens that do not have extra space for a freestanding dishwasher. How do I install an integrated dishwasher? To do this safely, you will need a qualified electrician to install your dishwasher for you. Luckily, we have a nationwide team of over 600 engineers and can take care the entire process for you. Find out more here. How do I install a freestanding dishwasher? What is a semi-integrated dishwasher? A semi-integrated dishwasher is partly hidden, sitting alongside kitchen cupboards with just the control panel on show for ease of access. What type of dishes can be washed in a dishwasher? Dishes, pots and utensils will generally have this information on the box or attached as a sticker when you buy them.